This book details the remarkable potential of terra preta, the recently rediscovered sacred soil of the pre-Columbian peoples of the Amazon rainforest, to reverse some of the most the catastrophic damage that has been visited on our environment. The authors lay out a fascinating description of how utilizing the biochar embedded in this highly fertile, living soil offers a way to free ourselves from dependency on petrochemicals, restore the health of our soils, and remove carbon from our overheating atmosphere by fixing it back where it belongs--in the earth. They predict that biochar could significantly contribute to the restoration of the planet to pre-industrial levels of atmospheric carbon by 2050. The book also shows that the rediscovery of terra preta is an opportunity to move beyond the West’s tradition of plunder and genocide of the native civilizations of the Americas by offering an invitation to embrace the deeper mystery of the indigenous methods of inquiry and to participate in an animate cosmos that gave rise to such a powerful technology as terra preta in the first place. 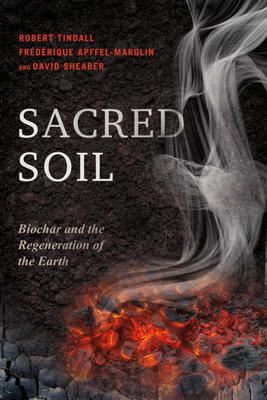 Sacred Soil, in recognizing the need for biocultural regeneration, takes a multi-disciplinary approach to the phenomenon of bio-char soils, utilizing mythopoeic, historical, anthropological, and scientific perspectives to embrace the deep past, the vexed present, and the prospectus for our future. Coming at this crucial juncture in human history, the potential resting in biochar is also an open doorway into the indigenous ways of knowing that enabled the pre-Columbian Amazonian high civilizations to support a population of millions while leaving their lands more fertile than when they arose. This book details the remarkable potential of terra preta, the recently rediscovered sacred soil of the pre-Columbian peoples of the Amazon rainforest, to reverse some of the most the catastrophic damage that has been visited on our environment. The authors lay out a fascinating description of how utilizing the biochar embedded in this highly fertile, living soil offers a way to free ourselves from dependency on petrochemicals, restore the health of our soils, and remove carbon from our overheating atmosphere by fixing it back where it belongs--in the earth. They predict that biochar could significantly contribute to the restoration of the planet to pre-industrial levels of atmospheric carbon by 2050. The book also shows that the rediscovery of terra preta is an opportunity to move beyond the West's tradition of plunder and genocide of the native civilizations of the Americas by offering an invitation to embrace the deeper mystery of the indigenous methods of inquiry and to participate in an animate cosmos that gave rise to such a powerful technology as terra preta in the first place.